Holocaust Child Survivors of Conn.
From 1939 to 1945 over six million of the nine million Jews in Europe were targeted and mass-murdered by the Nazis in the greatest tragedy to unfold in the 20th century. The Holocaust embodied Hitlers Final Solution to what he called the Jewish Question, a solution that called for the extermination of an entire race. Under the Nazis, six million Jews were systematically murdered by gas, bullet, starvation, disease, and exhaustion. Six million, a tally made worse when 1.5 million were children. For every one child who lived, nine others did not. One out of Ten is a documentary that tells the stories of those few children who survived. The power of the film is that it takes this incredibly brutal and horrible history and presents it through the most innocent of all lenses, a childs eye. Childhoods spent hiding away in attics, and basements, surrendering identities to hide from the Germans, trying to survive in the ghettos and concentration camps with death all around, these personal stories come to life in the words of the lucky few who did survive. 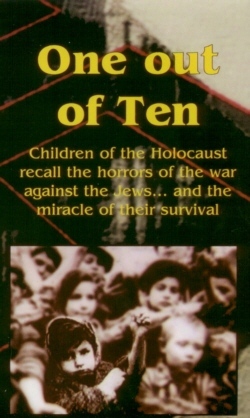 One out of Ten balances the presentation of the horror of the Holocaust with a sensitivity towards young audiences. The result is a documentary that is extremely well suited for use by schools and religious organizations for the education of children about the Holocaust. The film presents history in a linear fashion with detailed maps and images that illustrate the progression and timeline from 1938 to 1945. Since 1998, One out of Ten has been featured as a teaching aid across the United States and was awarded the 1998 silver medal at the New York Festival.